The Battle of Granada was a siege of the city of Granada fought over a period of months leading up to its surrender on January 2, 1492. The city was captured by the combined forces of Aragon and Castile (recently united as Spain) from the armies of the taifa Muslim kingdom of Granada. Granada's forces were led by Sultan Boabdil. This relatively small campaign was of momentous consequences as Granada, was the last outpost of Moorish rule in Spain and its fall brought to an end 780 years of Muslim control in the Spanish peninsula. Granada contains the beautiful Alhambra palace, a gem of Islamic architecture, the loss of which is mourned in the Muslim world. The fall of Granada marked the final act in the Reconquista, the campaign by the medieval Christian states of Spain to drive out the Moors. It was followed by the expulsion of Jews and Muslims from Spain, although some remained by converting to Christianity. Among these some remained secretly Muslim or Jewish (known as moriscos and morranos). Many, however genuine their conversion, were subject to the suspicions and interrogations of the Spanish Inquisition. In 1609, descendants of converts were also expelled. A society that had often seen Muslims, Jews, and Christians interacting positively had ended. The Fall of Granada was a factor in the Spanish and Portuguese drive to acquire overseas colonies, influencing their attitude of ineffable superiority towards the cultures and religions they encountered in the New World, for which Christopher Columbus set sail later in the year of Granada’s defeat. Rediscovery of the richness and positive cultural exchange of Moorish Spain before 1492, known in Spanish as convivencia, may provide clues on how contemporary multi-cultural societies can deal with the challenges of pluralism and of peaceful co-existence. In 711 C.E., the Moors invaded Spain under the leadership of Tariq ibn-Ziyad. In an eight year campaign, most of the Iberian Peninsula was brought under Islamic rule. An attempt to move northeast across the Pyrenees Mountains was thwarted by were Charles Martel at the Battle of Tours (732 C.E.). The Moors then ruled in the Iberian peninsula, except for areas in the northwest (such as Asturias, where they were stopped at the Battle of Covadonga) and the largely Basque regions in the Pyrenees, and in North Africa for several decades. Though the number of "Moors" remained small, they gained large numbers of converts. The Moor’s invasion of Spain, from the point of view of Christians in Europe, was always regarded as an act of aggression. Indeed, it was part of the outward expansion of the Islamic world that was informed by the conviction that the whole world should be subject to Islamic rule and to the divine law of Islam. However, the actual story of the invasion is more complex. The Visigoth King, Roderic, had raped the daughter of one of his Counts, Julian, who, in secret, approached the Moors and pledged support in the event of an invasion. Jewish advisers also accompanied the invading force. There is also evidence that some territory was gained peacefully through treaties that enlisted the "cooperation of local administrators and inhabitants." Constable (1997) reproduces a "Muslim-Christian Treaty" of 713, in which the ruler of Tudmir and his people are promised protection and religious freedom in return for an annual tribute and loyalty to the Sultan. The Alhambra, Granada, from Mirador San Nicolása - masterpiece of Islamic architecture combining natural and built spaces. The Umayyad’s sultanate (756-929 C.E.) and later caliphate of Cordoba (929-1031 C.E.) in Andalusia, came to rival the Abbasids at a time when the Fatimids also challenged their supremacy, and provides an example of an Islamic society where scholarship (which had already been patronized by the early Damascus-based Umayyads) and inter-community exchange flourished. The academies in Moorish Iberia were among the leading centers of scholarly excellence in the whole of Europe and attracted scholars from the University of Paris, from the University of Oxford, and from elsewhere, as well. The Moors excelled in city planning; the sophistication of their cities was astonishing. Cordova boasted hundreds of Mosques, public baths, some 80,000 shops, houses with air-conditioning, street lighting, beautiful landscaped gardens, and the largest library in the world at that time, containing 400,000 volumes more than "all the Libraries of Europe.” Without a doubt, during the height of the Caliphate of Córdoba, the city of Córdoba proper was one of the major capitals in Europe and probably the most cosmopolitan city of its time. 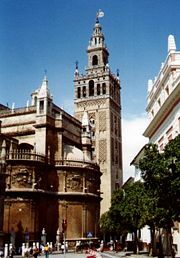 Jewels in the architectural crown of Moorish Spain included the Great Mosque at Córdoba (construction of which began in 784), the Giralda of Seville (1183) and the Alhambra in Granada (construction of the present structure began in 1238). Concerted efforts by Spanish Christians to recapture Andalusia began to break up the Muslim territory as cities were regained one by one. Barbastro fell in 1064. Toledo fell in 1085, and with this victory, impetus was given to the notion of a "crusade" to capture Jerusalem, inspiring the First Crusade, proclaimed ten years later. Although the Spanish conquistadors were never technically crusaders, they were depicted as such in the legends that grew up around the reconquista, such as the Song of Roland and the story of El Cid. By 1212 C.E., a coalition of Christian kings under the leadership of Alfonso VIII of Castile had driven the Muslims from Central Iberia. Córdoba fell in 1236, Seville in 1248. After this, the Muslim presence was confined to small enclaves or city-states known as Taifas, the most important of these being Granada, which was the last to fall. Since the spring of 1491, Granada had been all that was left of the former Moorish state, when the Spanish forces of King Ferdinand and Queen Isabella laid siege to the walled city. After several attempts to disperse the besiegers had been defeated, Prince Boabdil, the Moorish ruler, attempted to raise support from the Islamic Marinid state in Morocco. He negotiated a four month truce with the Spanish whereby he would surrender if no help was received by the expiry of the truce. This failed to materialize and, on the agreed date, the city capitulated. It is said that Boadbil then knelt before King Ferdinand, on January 2, 1492, to surrender the key to the city, provoking his mother to rebuke him with the famous words, "You weep like a woman for what you could not hold as a man." For many, the fall of Granada represented compensation for the Turkish victory in capturing Constantinople, not so many years earlier (1453). Andalusia remained buried deep in the Spanish psyche. Until the time of Franco, Islam was officially banned. No one was allowed to forget or challenge the historical Spanish position on Islam. Memories of Muslim Spain littered the Spanish landscape: Santiago, a religious figure, given the title the Moor-killer, that is, the killer of Muslims; hotels called "Reconquista," statues depicting Christian warriors in heroic poses, sometimes with their feet on the heads of fallen Muslims; and ever year festivals called "Christians and Moors" to commemorate the victory. Christopher Columbus himself referred to the Fall of Granada as an event that gave impetus to his voyages of discovery, since the Spanish were persuaded that it was their destiny to subdue other parts of the globe which remained outside the sphere of the true religion. Akbar Ahmed says that when the Spanish conquistadors reached the New World, they did so “fresh from the triumphs over the Muslims” and came with “the sword in one hand and the Bible in the other” and before long had destroyed “the Aztecs, the Mayas, and then the Incas, civilizations that stretched from Mexico down to the tip of South America” robbing the “Indians of their language, their culture, and their dignity” as they raped and looted. “The poor Indians,” he says, “did not know what hit them” and all this followed from their success at the Battle and Fall of Granada. Fresh from the defeat of Muslim Granada, the Spanish were propelled by the impetus of this victory towards the New World not primarily to trade, or even to colonize, but to conquer and only then to convert those who remained alive to what in their view was the one and only true faith. ↑ Ibn 'Abd al-Hakim, “Narrative of the Conquest of al-Andalus,” translated by David A. Cohen. ↑ Mehru Jaffer, Black Tuesday. Retrieved November 9, 2007. History of "Fall of Granada"
This page was last modified on 21 February 2009, at 23:22.